Autohaus has a real customer focus. All of the service people are very friendly and aim to please. They accomplished the work ahead of schedule. Eddie Garcia always takes good care of us and the 3 cars we bring in for Mercedes service. Service is performed in a timely manner, and service gets it right the first time! Conveniently located in Northbrook, IL, Autohaus on Edens is the chosen luxury auto dealer of drivers in Highland Park, Glencoe, Glenview, Winnetka, and surrounding Illinois areas. Our premium facility has been meticulously designed to exceed the standards of our clientele and reflect the outstanding quality of the Mercedes-Benz name. At our dealership, you’ll always find a full selection of new Mercedes-Benz models to choose from, including popular options from the Mercedes-Benz C-Class, Mercedes-Benz E-Class, and Mercedes-Benz GLA models. Also check out our certified pre-owned Mercedes-Benz vehicles for great offers on pre-owned luxury cars. When you’re ready to take the next step, our finance staff will be standing by to provide pressure-free financing and leasing options for you. 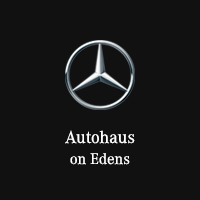 At Autohaus on Edens, we have the fullest respect for the engineering and design work that goes into every Mercedes-Benz luxury vehicle, and we know that it takes a special team to be faithful to that legacy. At our 34-bay, award-winning service department, we’ve hired only the most expert technicians to handle all your maintenance and repair needs. Whether you need tire service, a Mercedes-Benz Express Service, or more major work, just schedule an appointment online or stop by the dealership at your earliest convenience. The team at Autohaus on Edens is here to meet and exceed all your luxury automotive expectations, and we look forward to doing so day after day. Make the trip to see us Monday through Saturday at 1600 Frontage Road in Northbrook, IL to experience the quality service you deserve.